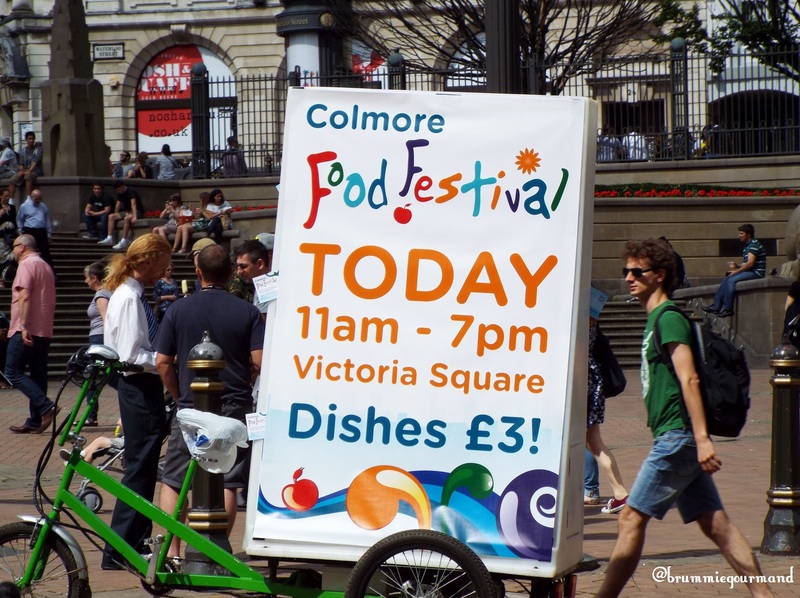 …Organised by the Colmore Business District. Its aim is to showcase the best of the local eateries in the area sandwiched between the main shopping centres of birmingham and the Jewellery Quarter. It’s now in its fifth year and has expanded exponentially since then. This time round there were 25 eateries from the local area and when I walked past on the way to my day job the setup was in full swing. It was a bright, sunny day and on my lunch break wifey and I returned looking forward to a few foodie lunch treats to tide us over until dinner. By the time of our arrival it was already in full swing. We made a beeline to Nosh & Quaff. The latest restaurant from the minds behind Lasan and Fiesta del Asado. It’s taken over the building sandwiched between Pure Bar & Kitchen (reviewed previously) and Chung Ying Central (review coming soon!) and it’s one of the most anticipated restaurant to be opening this year. There was a real buzz around the stall and quite a queue before we were served. Along with merchandise, there was a choice of two dishes. First up, a gourmet Frankfurter in a buttermilk bun with caramelised onions mustard, ketch and pickles, wifey plumped for this. I on the other hand, went for a Short Beef Rib, smoked in hickory and slow-cooked in a molasses glaze. A homemade slaw was the accompaniment. What can I say about the rib, except it makes me want the doors to open sooner. The meat was tender, well-cooked and slipped off the bone. The molasses glaze went well and I just wish there was more! The slaw was fresh and cooling but a little on the stringy side for my taste, perhaps the cabbage could do with another chop. The only word I got out of wifey from the bit she pinched was “Yum”. For wifey, the frankfurter lived up to the restaurants slogan #letsgetmessy! The frankfurter was smoky and had a great umami quality. The onions were well placed non-traditionally under the sausage. The sausage was dwarfed by the buttermilk bun and almost overpowered the rest of the dish, but tasted nice. Wifey’s verdict? It was worth every second of waiting and one of the best hot dogs for a long time. Cant wait for the lobster to make its appearance now! Unfortunately they didn’t survive long enough for photography. But each was delicious in its own right. With that it was a return to work to finish the remainder of our day. There was no reduction in the crowd in the intervening hours and with work duties completed it was time for a few beverages. I popped along to the Purity tent for a swift half of Longhorn IPA (no shocks there). Wifey’s more cultured tastes meant a stop off at the neighbouring Purnell’s Bistro / Ginger’s Bar tent for an English Garden Cocktail. Newhall Street homed Purnells Bistro / Ginger’s Bar is the diffusion restaurant from Glynn Purnell’s self named michelin starred restaurant around the corner on Cornwall Street. Formerly named The Asquith It’s been open since 2012 and has been a regular haunt for myself and wifey. The gin was mixed with apple, elderflower and lime and not too much lime either. It was refreshing after a friday in the office. After the liquid refreshment, peckishness returned and I strolled to the Opus @ Cornwall Street stall. Opus is a stalwart of the Birmingham food scene, opened a decade ago by Ann Tonks, Irene Allen and David Colcombe (who recently left and new Exec Chef Ben Ternant now running the food side), now has two further branches with Cafe Opus at Ikon Gallery and Bar Opus at One Snowhill (tucked behind Doddle). Accompanied by a wonderful brown sauce, new potatoes and a great green salad. The terrine was a great little dish. The cold terrine was full of flavour and the tart brown sauce set it off wonderfully. The surprise shock of the dish actually was the green salad and potatoes. I would happily have that on its own as a starter in the restaurant. The peas were delicious, sweet, and just the right amount of crunch. Whilst I gleefully tucked in to the terrine, wifey queued up for the Momo (chicken dumplings) from Jojolapa. Birmingham’s first nepalese restaurant a little further down Newhall Street from Purnell’s Bistro. Offering a mix of Indian and Nepalese food. Her Momo’s were nice and doughy and packed full of delicate chicken. were accompanied by a rich tomato sauce, and a complementary portion of the spicy chilli chicken helped it along marvelously. To finish off the foody side for the day a trip to the main Purnell’s was in order. I had hoped to get round to a bite of the slow cooked beef cheek, awarded best dish by fellow blogger Out in Brum but it looks like the droves had polished it off before I had chance. Instead my sweet tooth was sated by the best dessert. A light frothy portion of Violet Cream with Blueberries (hidden under the cream in the picture) and Meringue. It lived up to the high reputation of Purnell’s and was a great finish to the days range of food. The final beverage was a Gin Kallipo from Bar Opus. Like its namesake it was a icy treat perfect for cooling down after a hot day, except with addition of booze which made it even better. That was it for the Friday, as we left for the home, the smooth sounds of Jazz from the Jazz & Blues Festival accompanied our waddling, full and happy.